The versatile HP iPAQ hx2490 Pocket PC allows you to maximize Personal productivity through the use of Email, Calendar, and Contacts. It also comes equipped with Bluetooth wireless technology to allow you cable-free connections to other devices with Bluetooth technology such as printers or phones. * Integrated Wi-Fi (802.11b) enables high-speed wireless access to the Internet, e-mail, and corporate data solutions at the office, from home or at Wi-Fi hotspots. * HP ProtectTools secured by CREDANT Technologies, allows you to set a PIN or password to control access, and allows you to use industry-standard encryption to protect information stored on your device and your SD memory cards. * Featuring the Intel PXA270 520 MHz high-performance processor and offering 128 MB total memory allowing you to store personal data more securely and helps protect it from device power loss. * Mobile versions of Microsoft software are included (Word, Excel, PowerPoint and Internet Explorer) Microsoft Outlook 2002 for Pocket PC, Genuine Windows Mobile 5.0 for Pocket PC, Premium Edition. * Integrated Bluetooth allows cable-free connections to other Bluetooth enabled devices (mobile phones, printers, headsets and keyboards), and access your data via a Bluetooth enabled cellular phone. * Integrated Compact Flash Type II (CF) and Secure Digital (SD) slots for greater storage and expansion capabilities. * New automated backups through iPAQ Backup application. * Landscape and portrait modes supported in operating system. 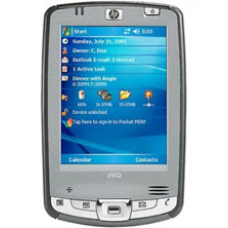 Box Contents: - GRADE B HP iPAQ PDA Refurbished - Removable/Rechargeable Lithium-Ion Battery - USB Sync Cable Main Features: - 128 MB total memory (64 MB ROM and 64 MB SDRAM), up to 88 MB user available memory including Persistent Storage Memory - Processor: 520MHz Intel PXA270 Processor - Integrated Wi-Fi (802.11b) - Power: Removable rechargeable 1440 mAh Lithium-Ion battery. - Transflective Colour TFT LCD [64,000 Colours] - Screen Dimensions: 240x320 pixel touch screen - SDIO Secure Digital Expansion Slot - also works with MMC [multimedia cards] - Compact Flash Type II [CF] Expansion Slot - also suitable for Microdrives - 3.5mm Headphone Jack - Microphone/Speaker can be used as a dictaphone - Dimensions: [w]76.6 x [h]119.4 x [d]16.3 mm - Weight: 164.4g Software: - Windows Mobile 5.0 - Contacts - Calendar/Appointments/Reminders - Notes/Tasks - Mobile Word - Mobile Excel - Mobile Powerpoint - HP ProtectTools - Data/Device Security Software - Mobile Internet Explorer For more details about iPAQ Repair and Parts grading system for refurbished units, click here to view our handy guide.